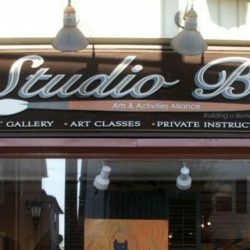 Boyertown, PA. Bob Wood, historian, writer, teacher, artist, potter, and popular presenter invites history buffs to his Sunday afternoon history talks at Studio B Fine Art Gallery, 39A East Philadelphia Avenue in Boyertown, PA, beginning on September 16, 2018, from 1:00-2:00 p.m.
Local history, interspersed with memories of his own life as a young boy on the farm, continue to inspire Wood’s weekly columns found in local newspapers and his casual Sunday afternoon discussions. September 16: The Markley Diaries—A detailed and sometimes surprising primary source record of local folk life and business in the late 18thcentury. September 30: Spring Houses—“An ever flowing spring” was a valuable addition to early homesteads, and spring houses were soon constructed wherever possible. October 21: “Drafted Clubs”—How Civil War draftees bought substitutes—Staggering casualty numbers terrified draftees into buying substitutes to serve in their stead. October 28: Sanatoga Speedway “The Action Track”—Mid-centurySanatoga stock car racescan best be described as, “for-the-fun-of-it,”yet thousands of fans filled the stands to cheer on their favorites. November 4: Farewell to Freinsheim: The story of the Sea voyage to Colonial America; plus an Antes Family timeline.